iSkoot for Skype is a solution for Skype on the go - an easy-to-use mobile application with all your favorite Skype features. iSkoot offers network service for iSkoot for Skype. iSkoot's technical architecture takes advantage of the best features of your mobile operator's existing voice and data networks. Routing Skype calls over the voice channel ensures your Skype calls sound as good and connect as well as any other calls you make from mobile. ISkoot for Skype (BlackBerry) is a solution for Skype and Blackberry on the go. ISkoot for Skype (BlackBerry) offers network service for iSkoot for Skype. iSkoot's technical architecture takes advantage of the best features of your mobile operator's existing voice and data networks. Routing your Skype calls over the voice channel ensures that your Skype calls sound as good and connect as well as any other calls you make from your mobile. ISkoot for Skype (BlackBerry) is free to download. Making a Skype-toSkype call: when you call a Skype contact on your mobile phone, it costs the same as making a local call so depending on your mobile calling plan, normal airtime charges may apply. Once you're connected to the Skype network, your call works like a regular voice call from your phone. 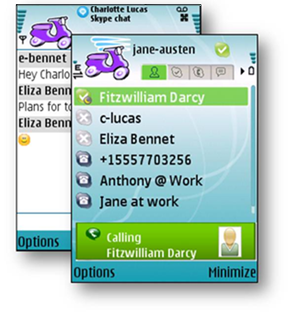 Qweas is providing links to ISkoot for Skype(BlackBerry) 2010 as a courtesy, and makes no representations regarding ISkoot for Skype(BlackBerry) or any other applications or any information related thereto. Any questions, complaints or claims regarding this application ISkoot for Skype(BlackBerry) 2010 must be directed to the appropriate software vendor. You may click the publisher link of ISkoot for Skype(BlackBerry) on the top of this page to get more details about the vendor.